The work of Giacomo Ceruti was largely forgotten over the centuries and was only rediscovered from the 1920s onwards as a result of three exhibitions. The first, held in florence in 1922, was devoted to 17th- and 18th-century Italian art and included one of the artist’s masterpieces, The Washerwoman, from the Pinacoteca in Brescia, a work that aroused the curiosity of both the public and experts. Roberto Longhi subsequently investigated the life and work of Ceruti and other artists of his circle in an exhibition held in Milan in 1953 entitled Painters of Reality in Lombardy. Eight years later Ceruti occupied a central position in an exhibition held in Paris that focused on 18th-century Italian painting. Ceruti produced religious paintings and portraits, and the Thyssen-Bornemisza collection has a pair of busts by the artist previously in the Martinengo collection in Brescia. 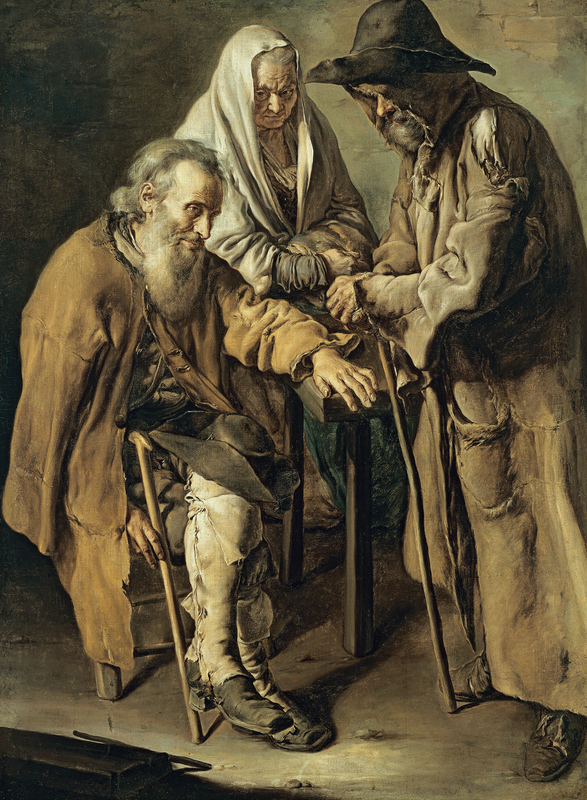 Perhaps most notable within his oeuvre, however, is the sizeable series of canvases, many of them of large format, that depict the least favoured members of society (beggars, peasants, dwarves, tramps, etc) as well as the humblest trades, all depicted with enormous dignity and realism and with a complete disregard for convention. Ceruti was able to reveal fragments of his poor sitters’ everyday lives without the need for any sort of anecdotal approach, always maintaining a humane vision. As Mina Gregori emphasised, the note of social critique that has been detected in his works contains a moral aspect in its denunciation of poverty as a condition and way of life. It has also been suggested in this regard that the artist included possible literary references and that some of these canvases have hidden meanings that are lost to us today. Specialist authors have analysed the influences and forerunners of these compositions by Ceruti in which he depicted a world highly different to those painted by other artists of his day. Among artists to whom he may have looked are the Danish painter Bernhard Keil, the Italians Antonio Cifronti and Pietro Bellotti and above all the French painter Jacques Callot, whose prints Ceruti used for some of his compositions. An interesting issue with regard to these works is the nature of the clients for whom Ceruti was painting. In the case of the present canvas we know that it was acquired in Venice by a German collector, Marshal Matthias von Schulenburg. From the inventories of the Marshal, whose large collection included around twenty works by Ceruti, we know that they were recorded under the heading “Illustrious modern paintings”. This fact has led to the suggestion that they were specifically commissioned by the Marshal from Ceruti, which could also be the case with the series painted for the Avogadro family. The present canvas was taken from the Marshal’s house in Venice to his Berlin residence, the Schulenberg palace. It was subsequently auctioned in London in 1775. Prior to its acquisition for the Thyssen-Bornemisza collection in 1975 it was in two UK collections, that of Malcolm Waddingham and that of Vincent Korda, between which time it was in France where it was catalogued as by Louis Le Nain. In the present canvas, which was published by Volpe in 1963, Ceruti reflects the unstable lives of the two male figures through their precarious poses, with both men leaning on crutches. In contrast to some of his other paintings, he replaced the use of an urban or rural view in the background with a simple, almost monochrome one that is more appropriate to the ragged figures. The narrow colour range with its emphasis on browns, greys and ochre tones makes this presentation of the beggars even more realistic. The canvas, which is one of the artist’s masterpieces and one of the great works in the Collection, is a magnificent example of the humanity with which Ceruti painted his subjects. These three old people, whose poses reflect both resignation and lassitude, have in Rosenbaum’s words, “a heroic bearing characteristic of a stoic dignity”, a quality that perhaps reveals something of Ceruti’s attitude towards this desperately impoverished sector of society.